Every member of the IACT Health team shares a mission to improve the human condition and the life of each patient. We work together with a growing number of clinics across Georgia to create process efficiencies, raise the level of data excellence and speed resources to the market in a complex and highly regulated environment. We have a vast network of Principal Investigators that have met our rigorous criteria and training. We are constantly cultivating and strengthening our network of pharmaceutical research industry leaders, Institutional Review Boards (IRB), hospitals, government and community-run healthcare clinics, as well as inpatient- and outpatient-based physicians so that we can enhance the speed, quality, and accuracy of medical research. Our Employees Experience and Produce Excellence. 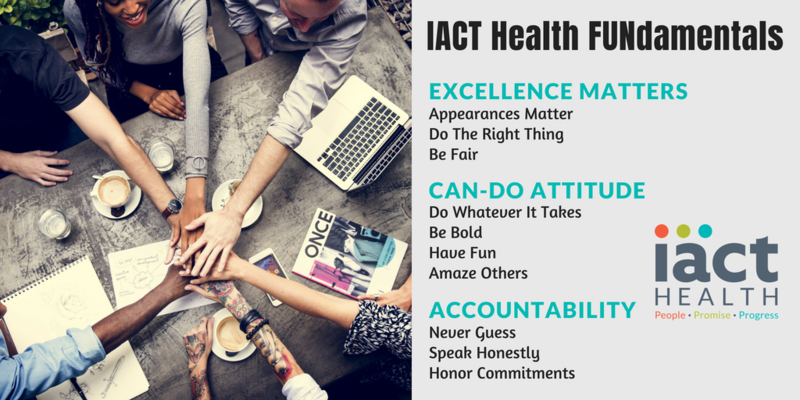 IACT Health offers an award-winning and professional work environment with competitive salaries and an excellent benefits package. We are always seeking qualified specialists in our corporate and clinical divisions. If you are interested in becoming a part of our close-knit accomplished team of specialists, please send your resume and salary history by mail or email. Please call us if you have any questions.